This section of my website has been put together to assist my current students. I provide the link in the course profiles. Whether they choose to access it is up to them - but it saves me having to rewrite everything every year. 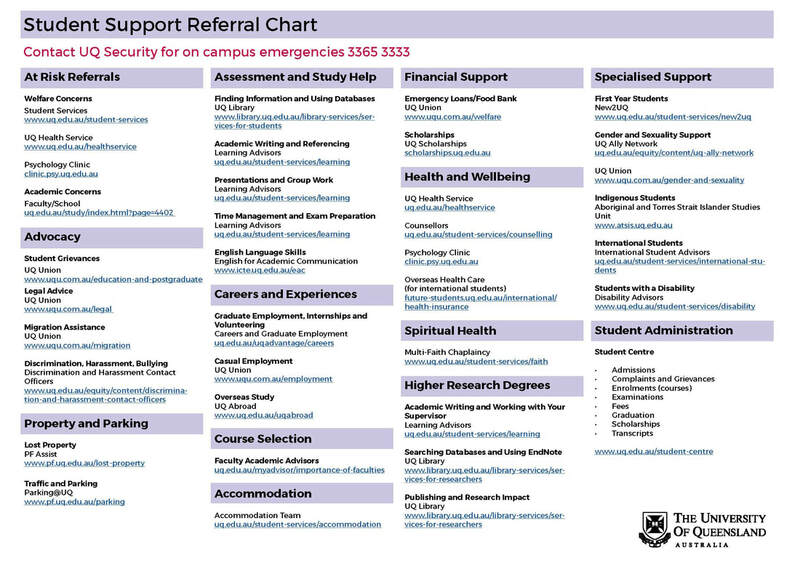 Below the UQ Student Support Referral Chart is a list of common questions students have about where to go for support and how to get the help they may need. UQ Library provides assistance with: research support and finding the information you need, IT help, printing, Blackboard hassles, and internet connection issues. ​Brought to you by UQ Union, SHOC (Student Help On Campus) is a free, independent, short term support service for all UQ students. SHOC can provide you with assistance on matters relating to the following services: Education & Equity, Employment, Gender & Sexuality, Legal, Migration, and Welfare. Q: Do you have any tips on studying and writing? Over the year I have collected a links and resources to assist studying. I have collated them on my "Study Skills" page. Q: Help! Life is falling apart! Can you help me? ​I am not a counsellor and unable to provide individual support for personal problems. However the good news is that there is lots of support available for students at UQ, most of which can be accessed via the student services website, including one-on-one consultations for learning support or crisis counselling. Make sure you access the support you need before things become overwhelming. Just click on the button above. Q: Help: my computer is falling apart! Lots of students have difficulties with computers: whether it be simply getting them to do what they want them to do or coping when they misbehave or completely collapse. Unfortunately your lecturers have the same kinds of problems and are usually not in a position to help. You will find the IT helpdesk much more useful. You can access them through the library website: just click on the button above. You are encouraged to manage your time carefully to submit your assignments early - to leave time for any computer hassles. If you are seeking an extension because of extended computer difficulties you will need to provide evidence (eg computer repair receipt, letter from IT service etc). And of course, make sure you back up your work in multiple places. Q: I can't access the course readings and materials - can you fix it? A: The library advises that if you are having trouble accessing materials, please get in touch with the library via AskUs in person or chat service. You will find the library much more useful than asking me about anything technical around Blackboard or Library databases. Q: Can you please read my draft? Q: I'm not familiar with university writing standards and want to do a good job. Are you able to read my draft? A: No. With so many students across my courses this is physically not possible. But I am always happy to talk to students about their ideas and to see assignment outlines. Q: How do I ensure a 7/High Distinction grade? Q: I really need a grade of "7". Can you please look at my assessment outline to tell me if I am on track for a 7? A: No. All I can do is tell you if you have understood the assignment and look to be on the path for a pass. How well you execute it and go beyond a pass grade is up to you. My main concern is ensuring students pass the course. If you want to ensure you are doing the best you can do I urge you to read all the information very carefully, engage with relevant readings, attend the workshops, engage in the class as actively as you can, start your assignments early, manage your time well, see Student Services and attend their workshops or see a learning advisor. Q: English is not my first language - will I be penalised for this? ​The question of how English standards are taken into consideration is a tricky one and I wrestle continuously with this. As you progress with your studies you will find different lecturers deal with this in different ways depending upon the course and the cohort. So this is my current thinking, but I’m open to ideas. Firstly I'm sure I have no idea how hard it is to communicate – let alone study – in another language and I have nothing but admiration for you for doing so. When I survey the classes I teach I find students from up to 29 different countries and with around 18 different languages in any one class. Although students have passed the necessary entry tests, people’s skill levels vary across speaking, comprehension, reading and writing, and what some do with ease, others struggle with. I’m also conscious that for some, English isn’t their first or even their second language but may be their 5th or 6th. Some students are double translating – translating from their local tongue into a national language, before translating to English and back again. No wonder it’s exhausting. Being a student for whom English is not your first language gives you an additional degree of difficulty in your studies. The ability to collect, analyse and organise information and ideas and to convey those ideas clearly and fluently, in both written and spoken forms. The ability to interact effectively with others in order to work towards a common outcome. The ability to practise as part of an inter-disciplinary team. The ability to select and use the appropriate level, style and means of communication. The ability to engage effectively and appropriately with information and communication technologies. So there is the challenge of ensuring that you meet particular – and very high – standards, with my personal need to be compassionate and help you adjust to this demanding system. I have developed a particular way of approaching this. I strive for a balance of written and spoken English in assessment, or only take written expression into account in some of the assessment items. I make written expression a particular marking criteria and make the weighting of this clear. Where written or spoken English is a problem I try to provide very specific feedback on this so the student knows what to get assistance with, including providing some detailed editing on papers as an example of the work to be done. Having said this, there are cases where, due to expression, I simply cannot understand what is being said and the bottom line is that I cannot mark what I cannot understand. That goes for both international and domestic students. The good news is that there is lots of help available and I encourage you to access this in between semesters. I have seen many students absolutely fly once they understand the standard expected and the patterns in the errors they make. It may not be much comfort, but academics continuously receive feedback on their expression and grammar when they submit papers to journals. It’s part of the academic system. The emphasis is always on helping each other to learn and improve and to be the best we can be. I hope the feedback you receive will assist you to do the same.